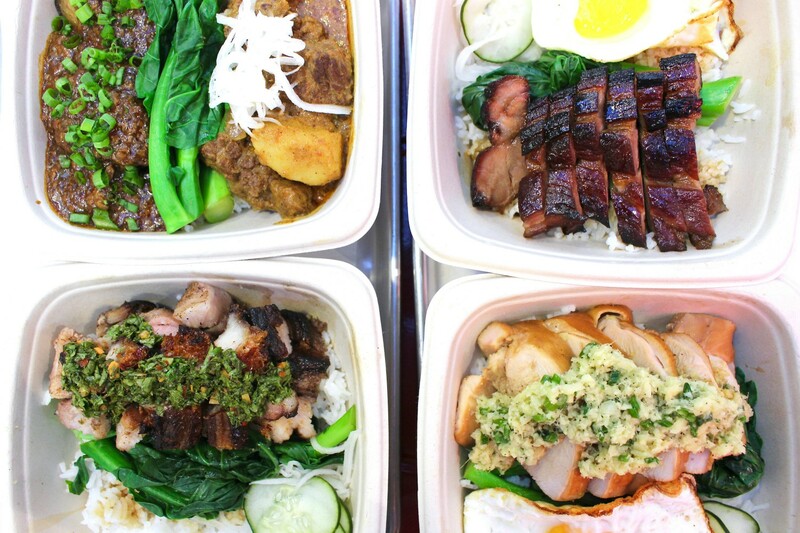 The dishes at downtown L.A.’s newly opened RiceBox pay tribute to classic Cantonese barbecue, but you won’t find whole roasted pigs or ducks hanging in the restaurant’s windows. The restaurant’s owners, who are are drawing from three generations’ worth of passed-down family recipes and updating them with French and Italian techniques, are so obsessed with keeping their barbecue juicy that they make theirs fresh every day, never letting their meats dry out behind glass windows or in steam tables. We followed chef Leo Lee in the kitchen for a behind-the-scenes look at how he’s steering away from the traditional by using special ingredients and applying techniques he learned at New York’s Culinary Institute of America (CIA) when cooking his wife’s family’s coveted barbecue recipes. Siu yuk is Chinese comfort food in the form of a slow-roasted whole pig. When the finished product is chopped into rectangular chunks, it’s mostly made up of tender and fatty pork, with crispy skin that crunches with every bite. Instead of roasting a whole pig, Leo channels the Italian porchetta method of rolling a slab of pork belly with spices before slow-roasting it. While he admits they don’t have the luxury of roasting whole pigs in their diminutive shop space, it’s mostly a quality control issue to ensure his customers are getting the freshest barbecue. 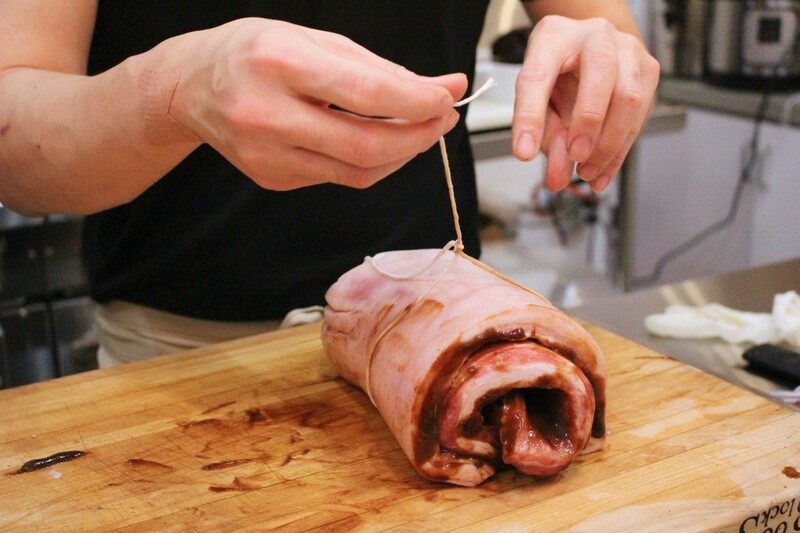 For the Lees, making siu yuk porchetta-style means they can control how much product they push out and there are never any leftovers that they have to sell the following day. 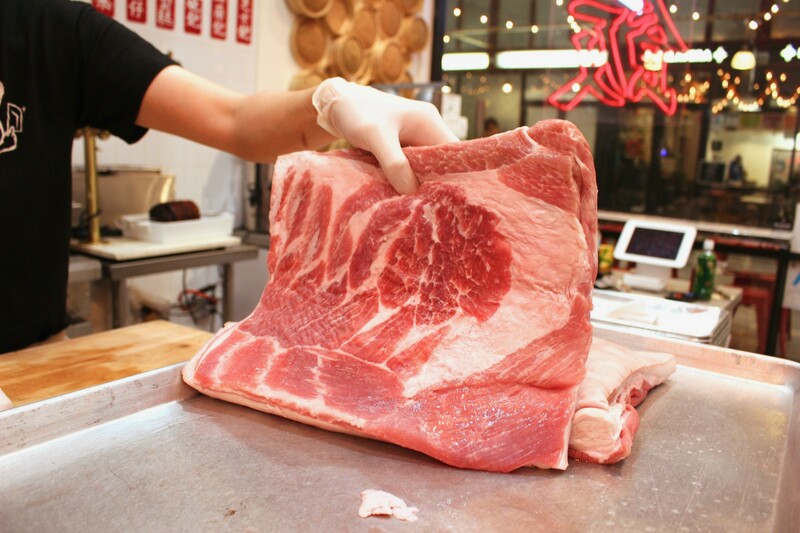 Leo Lee starts with a thick, six-pound slab of high-quality, hormone- and antibiotic-free Duroc pork belly. After having tested several types of pork over the three years he spent tweaking his recipes, the chef found that Duroc pork had the perfect fat-to-meat ratio for what he was trying to achieve, with beautiful marbleization. 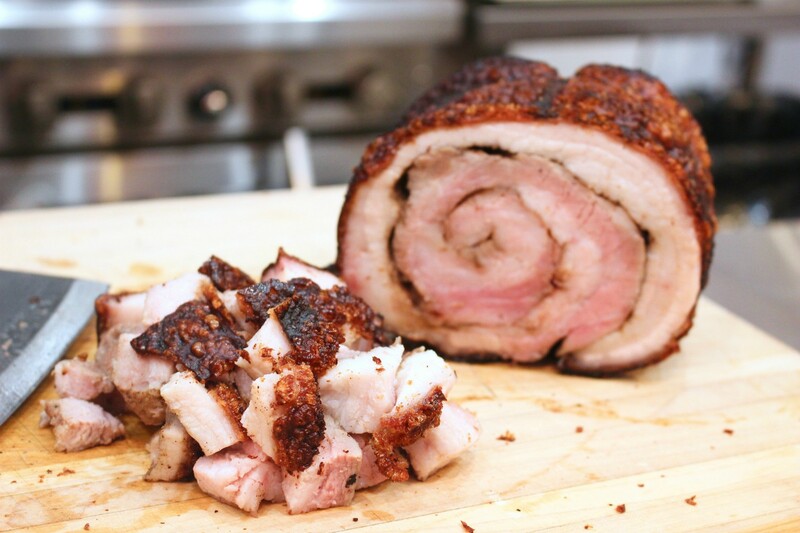 He spreads a mixture of a seven-spice dry rub as well as a wet rub over the slab, rolls it up into a tight log, and uses butcher’s twine to wrap it into a cylindrical package like you would with porchetta. He lets it sit for 24 hours to marinate, and then through a triple-roasting process, slow-roasts it for three-to-five hours in a vertical barbecue smoker before turning up the heat to crisp the skin, giving it its signature golden, bubbly texture. “It’s basically the traditional siu yuk that you eat, but because it’s rolled up, it’s juicier. There’s no dry part in it and it’s more flavorful this way,” Lydia says. Making these porchetta cracklings is a test of patience. It takes 36 hours from start to finish. 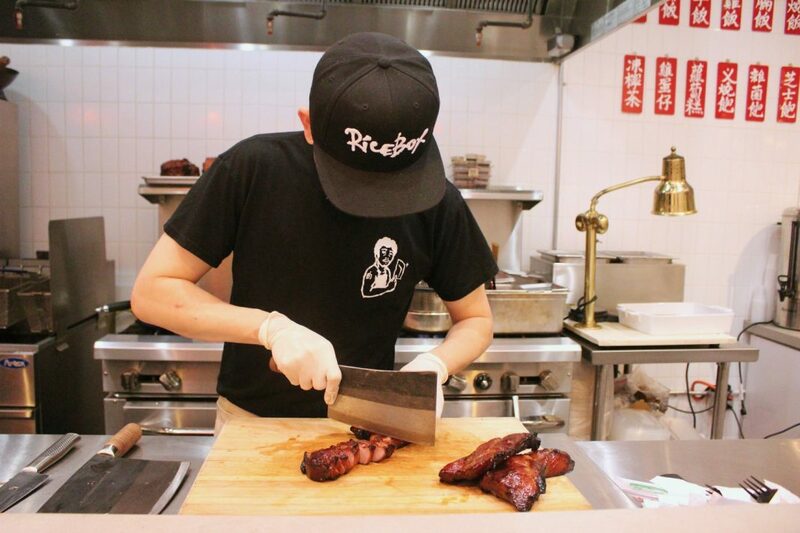 It’s the most time-intensive dish the Lees sell at RiceBox and they go through four-to-six slabs of pork belly a day. Leo Lee notes that just like with any other type of barbecue that you might find in the U.S., there are no shortcuts in the process. When it comes to RiceBox’s honey-glazed char siu, everything is in the details. 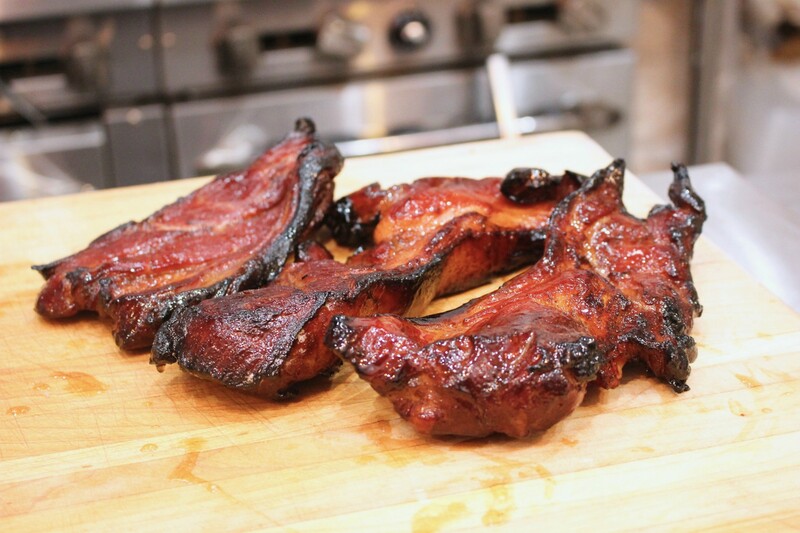 Leo Lee also uses Duroc pork, specifically the shoulder cut, for this Cantonese classic. In addition to featuring high-quality meats, Leo Lee also likes to go as natural as possible with his ingredients. You won’t find red dyes added to the char siu like you might find at Hong Kong-style barbecue joints, nor MSG. The choice to not use MSG isn’t because of the misplaced perception that the additive is unhealthy, as Leo Lee points out. He just thinks removing MSG from dishes is the direction that the next generation of Chinese restaurant chefs are moving toward. He proudly accepts the challenge to not rely on MSG to make a dish’s flavors more robust. Leo Lee created a spice blend to use as a replacement for MSG that he adds to his char siu (as well as the porchetta crackling) marinades. The pork is marinated in this mixture for 24 hours, which lets the flavors seep deep into the meat. He bastes the pork with honey and then throws it in the barbecue smoker at 600 degrees for 15 minutes. The chef meticulously repeats this process three times until he gets a perfect cut of char siu. From cooking it under such a high temperature, the juices are trapped inside the meat and under the outer caramelization of the honey glaze. 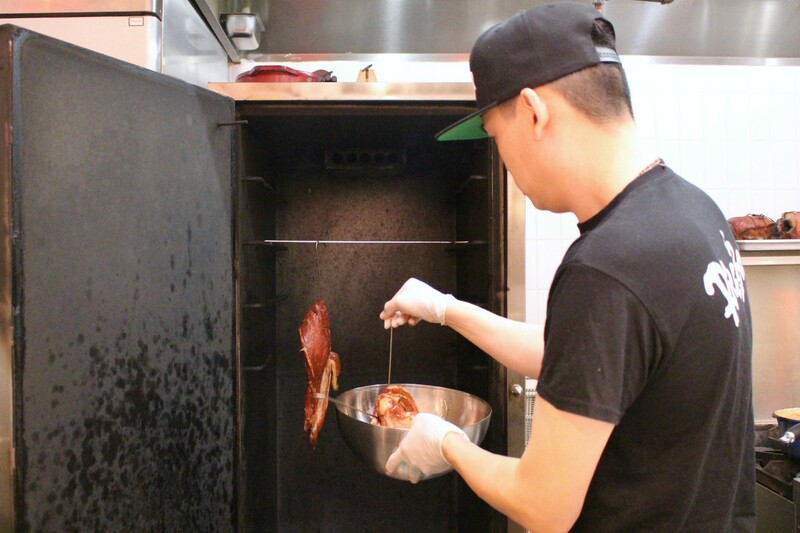 The char siu is one of RiceBox’s best-selling items, and the team will go through 45 to 65 pounds of meat a day. It also makes its way into the restaurant’s bao, made fresh in-house daily, including the RBX Bao that’s filled with chunks of the barbecued meat and gooey Monterey Jack cheese. The bun’s dough is marbleized gray and white due to the inclusion of activated charcoal. Lydia Lee says she was skeptical at first when her husband suggested adding cheese to the traditional bao, but she soon became a convert. “[The cheese] doesn’t take away from the flavor, but actually enhances it,” she says. There’s both a modern and and old-school feel to RiceBox, and it oozes with nostalgia for Cantonese culture. In the restaurant’s window, the Chinese character for rice, 飯 (pronounced as fàn), is expressed on a red neon light fixture. 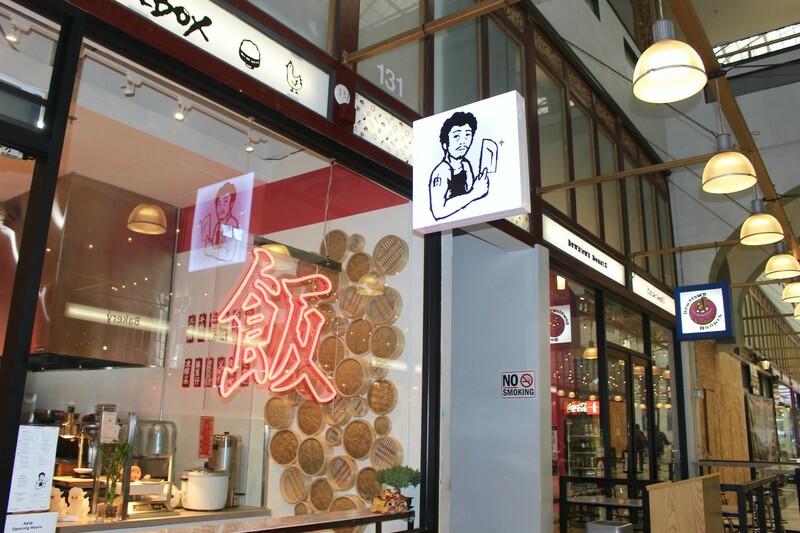 It’s placed under RiceBox’s logo and mascot, a drawing of Chinese actor and filmmaker Stephen Chow portraying a butcher in the 1994 comedy-action film, From Beijing with Love. Bamboo steamers serve as decor on one wall, and on the other side of the small restaurant, Chinese food-centric films like The God of Cookery, another Chow comedy export, are projected. There’s also a mix of cultures, just like the food of RiceBox, as the couple plans on screening American movies like Waiting and The Princess Bride. RiceBox isn’t only about barbecue. The small, carefully curated menu also features tender slices of Mary’s organic chicken poached in black soy sauce and topped with a generous helping of a ginger-scallion mixture, and Leo Lee’s grandmother’s curry beef stew recipe made with six-hour braised beef brisket. RiceBox also provides comfort food that caters to vegans, like its twist on spicy mapo tofu, but made with braised shiitake and crispy eggplant, and a bao filled with wild mushrooms, vermicelli noodles and a vegan barbecue sauce. Most of the dishes at RiceBox are iterations of recipes stemming from Hong Kong-born Lydia’s family. She comes from a long line of restauranteurs. Her grandfather owned a small barbecue joint in Hong Kong’s bustling Central district for over 20 years, and her uncle still runs two barbecue restaurants in Taiwan. She took her family barbecue recipes and shared them with her husband, who also comes from a family of restauranteurs. Leo, whose parents are from Hong Kong and China, spent his formative years living in Mexicali, Mexico, and L.A. When he was a teen, he would help out at his grandparents’ Chinese restaurant in Mexico, which spurred his love for cooking and eventually led to him pack his bags and moving to Hyde Park, New York, to attend CIA. His education didn’t end there—he continued on to get a degrees in hoteling and hospitality management, eventually using his skills to teach at the Art Institute of California in Santa Ana. During these years, he worked on and off with the Patina Restaurant Group, most recently managing its downtown market cafes. She feels that Sichuan food is getting all the attention right now in Chinese culture, and while they are excited about that, they also wanted to bring a spotlight back to Cantonese food. Lydia says Cantonese fare in L.A. had its heyday in the 1990s with places like the San Gabriel Valley’s ubiquitous Sam Woo Barbeque. However, she thinks that for many people, they’re mentally stuck in that time period with the idea of what Cantonese barbecue is. The Lees have set out to do it better. RiceBox, 541 S. Spring Street #131, Downtown L.A.
Stay up to date with everything you need to know about L.A. by following us on Facebook.